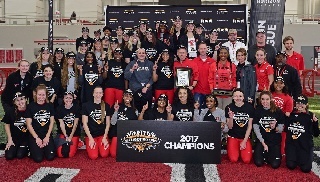 The Youngstown State women's track and field team used a complete effort to win their third Horizon League Indoor Track and Field Championship in the past four years as the meet concluded on Sunday at the WATTS. YSU accumulated 183 points while Milwaukee was second with 140 and Oakland was third with 138. Winning titles on Sunday for the Penguins were Abby Jones (high jump), Jaynee Corbett (shot put), Taylor Thompkins (60m), Amber Eles (60m hurldes) and Taylor McDonald (200m). Jones started the day off with an impressive effort in the high jump. She cleared 1.69m on her first attempt which gave her the title after teammate Chenera Lacey failed to advance. Jones then cleared 1.72m on her third attempt to set a new career high. She was just 0.01 meter shy of the school and Horizon League Championships record. Corbett captured her second straight Horizon League Indoor Track and Field shot put title with a season-best throw of 14.91m. Corbett won the title by 0.90 meters on Sunday. After fouling on her first attempt she had five straight throws of more than 14 meters. Eles had a memorable day running a school-record time of 8.64 seconds in the 60m hurdles. It was her first Horizon League title and a sweet moment for Eles who fell early in last year's 60m hurdle final race. In the 60m dash, the Penguins went first and second with Taylor Thompkins winning the race in a time of 7.62 seconds while Jaliyah Elliott was second with a time of 7.65 seconds. It was the third straight win in the event for the Penguins. In the 200m dash, another Taylor, Taylor McDonald giving the Penguins seven straight titles in the event. McDonald had a time of 24.90 seconds to win the race while Elliott was second at 25.10 seconds. Placing fourth was Thompkins with a time of 25.14 seconds and Keishawnna Burts was fifth at 25.39. Earning league accolades were Elliott (Outstanding Freshman Runner), Chandler Killins (Outstanding Field Freshman), Corbett (Outstanding Performer - Field Events) and Brian Gorby was named the Coach of the Year. Corbett was also named the Alfreeda Goff Athlete of the Year for her performance throughout the season. Killins third place in the triple jump (11.55m). McDonald fourth place in the 60m hurdles (8.82 seconds). Burts was second in the 400m dash (56.23 seconds).